Risking their own lives as they toiled through the night, firefighters formed a human chain to rescue a swathe of Notre Dame's "priceless treasures." Some 400 firefighters tackled the huge blaze at the 12th-century Gothic masterpiece and, oblivious to the danger they faced, saw their efforts rewarded as they saved the main structure. They also brought out many relics by going inside even as the inferno spread quickly on the medieval roof beams -- not least the Holy Crown of Thorns and a sacred tunic worn by 13th-century French king Louis IX. Their lack of self regard as they to retrieved countless other items prompted President Emmanuel Macron to praise their "extreme courage." "We started to panic when we smelt scorching," even before the flames emerged, said Philippe Marsset, vicar general of Notre-Dame who watched aghast with horrified Parisians and tourists as the drama unfolded. Within an hour, Paris mayor Anne Hidalgo told AFP that "General Jean-Claude Gallet (the commander of the Paris fire brigade)is explaining to us that it will be very difficult to save the (wooden) roofing but that the priority will be to save the relics." While armchair critics have suggested more could have been done to slow the fire, tough choices had to be made, said Plus, adding they could not have hoped to save the roof by that stage. "Heritage curators had a prevention plan which indicated what was most important in each room of the building," said sources close to Hidalgo, who afterwards heaped praise on all involved. "A tremendous human chain formed comprising firefighters, police and municipal workers," which stretched for some 200 metres and managed "to save dozens and dozens of artifacts" by passing them along the chain and out to safety, Hidalgo noted. "They put their lives at risk to protect this priceless treasure," said Monsignor Patrick Chauvet, Notre Dame's chief cleric. For Christophe Girard, overseeing cultural affairs at the city hall, "it was as if we were transporting a heart destined for a transplant." "Policemen were carrying crosses, firefighters enormous candles and tableaux," another town hall official said, marvelling at the almost superhuman effort. Three lorries headed off with many of the rescued items, initially to the nearby town hall while interior secretary of state Laurent Nunez reflected that "a quarter of an hour, half an hour" more would have been too late -- the treasures would have been lost. "You could smell the burning," said Justine Heller, 29, a town hall security inspector, as the historic treasures arrived. Guarding them would, she said, be "an honour" as Notre Dame embarks on what President Emmanuel Macron calculated would be a five-year restoration process. Within hours of their removal, the treasures would be on the move once again, this time to the Louvre, for safe keeping. Back at a disfigured Notre Dame, annually visited by more than 12 million people, emotion was still in the air as bystanders viewed the terrible spectacle, some placing roses on the cathedral plaza. Girard delved into Paris' literary as well as its architectural history by quoting Victor Hugo, who in his novel "The Hunchback of Notre-Dame" told of Quasimodo's fight to save Esmerelda with stones and fire inside the cathedral. 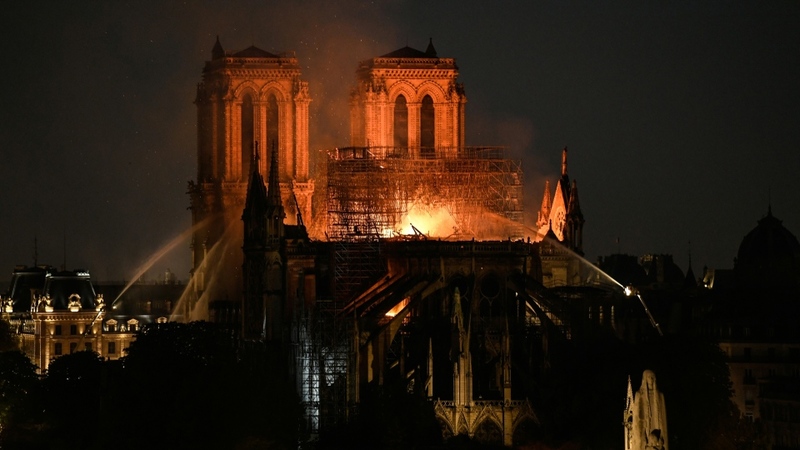 That "vast, disordered and furious flame" would, Hugo wrote in his 1831 novel, leave those who saw it "terrified to behold the gigantic shadow of the towers of Notre-Dame."